Large Luxury Pool & Hot Tub - New Kitchen - Golf Cart - Right Across from Beach! DISCLAIMER: These are old photos! NEW PHOTOS COMING SOON! Many upgrades and changes have been done to this home. We've done over $150,000 in upgrades to this house! We tore off the back porch and old pool, built a huge NEW luxury pool with hot tub! Downstairs - New Flooring, New Paint, New Furniture, New Decor! New driveway! As soon as we have the new photos posted we will be raising the price. Book now to get the old prices! Sleeps a total of 23 people so a great home for 4-5 families with kids, or up 18 adults max with no kids. If you have a larger group, we have 3 houses all right next door to each other here! (See VRBO # 649 and 471914). A BRAND NEW PRIVATE POOL and SPA are currently under construction! You can enjoy our brand new 15’ x 30’ private pool (one of the largest in Crystal Beach) with a large wet deck and spa/hot tub. It’s a gorgeous pool with custom mosaic tile and a large sunning deck all around for you to enjoy the Destin sunshine! The raised spa has a waterfall effect into the pool. We’ll post new photos soon! “Nantucket House” easily accommodates 14 adults and up to 9 children (in beds--not sofa sleepers!) with 6 BEDROOMS, including 4 KING Masters, a Triple Queen Bedroom (3 queen beds), and a 3rd floor Bunk Room with 2 sets full-over-full beds (yes, that’s 4 full-size beds). It also has 6 FULL BATHROOMS. And an added extra bonus for your large group, we have installed TWO sets of full-size washers & dryers. There is even a 4-PASSENGER GOLF CART to make beach access or just getting around Crystal Beach even easier! Right ACROSS from the BEACH on Scenic 98, this incredibly nostalgic, Nantucket-style is home updated decor, plantation shutters, vaulted ceilings, and a completely remodeled 3rd floor with OCEAN VIEWS. Recent renovations have added modern conveniences for your comfort while preserving the unique retro-charm of this large, New England-style beach home. There is also plenty of room for everyone to gather in the spacious living area and the open, custom kitchen and dining area has everything you’ll need to prepare and enjoy meals for your large group. You’ll love the beautiful screened-in private pool with plenty of outdoor deck space to enjoy relaxing mornings and evenings, semi-secluded with beautiful oleander trees. And when you’re ready for the beach – it’s just across the street! We keep our home clean and well-updated and pay attention to amenities you expect, such as the high-speed internet (free wifi), nice flat-screen TVs, high-definition cable, high-quality linens, hair dryers in each bathroom, and more. We also provide items our smaller guests may need like a high chair and pack-n-play. Inside this exceptional home, you’ll find a bright and inviting living area with gleaming tile floors, a brick fireplace, and beautiful tongue and groove wood details on the walls and ceilings. The leather sectional, chaise and side chair are all new, and you’ll appreciate the big HDTV with DVD player. Double French doors open onto a large deck with seating and a natural gas grill for great meals outdoors. The wide open spaces continue in the beautifully updated kitchen, with new high-end stainless steel appliances, including an extra-large, side-by-side refrigerator. In this well-appointed kitchen, you’ll find all the dishes, pans and utensils you may need, a Keurig D-Cup coffee maker, as well as a regular drip coffee maker, and even a few spices, to get you started. There’s room for 12 at the custom banquette with new table and chairs, and more dining space and seating at the long kitchen counter. We want you to feel at home, and the large, open layout is a perfect gathering spot for your family or friends. This is a very large bedroom that is perfect for guests who would prefer to stay on the 1st floor. It features a KING BED, an armoire with a flat screen TV and it has a direct access to the pool. There’s a bedside table with a lamp so you can enjoy a good book while on vacation. A sleeper chair provides a nice place to relax, or perhaps for a child to share your room. You will also appreciate the large private ensuite bathroom. This spacious private bathroom features a large vanity with two sinks and plenty of storage, a commode & a large walk-in shower. This lovely full bathroom is convenient for everyone to use on the 1st floor. There’s a vanity, commode and tub/shower combination..
You’ll find the first full-size washer & dryer in the 1st-floor laundry room which has a separate outside entrance. There is also another smaller fridge with an icemaker in here. Great for drinks! To make things even easier for your large group, there’s another washer and dryer on the 2nd floor! This bedroom features a KING BED, vaulted ceiling, a custom window seat, a dresser, and a flat-screen TV. There’s also a closet for convenient storage, bedside table, and lamp. Guests share the full bathroom with Bedroom # 3 guests. There’s a KING BED, vaulted ceiling and a custom window seat. Guests will also appreciate the closet and dresser for convenient storage. This room also includes a bedside table and lamp and a flat-screen TV. Guests share the full bathroom with Bedroom #2 guests. This full bathroom is shared by guests in the Bedrooms #2 and #3. It features a vanity with storage and extra counter space, a commode, and large walk-in shower. This bedroom has a comfortable KING BED, a custom window seat and a flat-screen TV with DVD player. There’s also a bedside table with lamp, a closet and a private attached bath. This private bathroom for Master bedroom #4 and features a single vanity with storage, commode and a large walk-in shower with glass doors. Children, teens, and adults alike LOVE this bedroom! It features 3 QUEEN BEDS, HDTV and a built-in dresser. It’s the room that everyone talks about with lots of space and beautiful vaulted ceilings, a sofa, and chaise for extra seating and bedside tables and lamps between the beds. This room also has its own attached full bathroom. Guests staying in the Triple Queen Bedroom will appreciate this large full bathroom which features a double vanity, a commode and a tub/shower combination. Renovated in 2015, the 3rd floor now has additional space for a BUMPER POOL TABLE with windows all around - enjoy the OCEAN VIEW! The walls and vaulted ceilings are finished in beautiful tongue and groove wood details and a brand new 6th bathroom was added to this space! It’s a great place for children or teens to hang out. However, adults will want to check it out too - for a game of pool and definitely for the view! There are 2 full-over-full bunk beds (yes, that’s 4 full-size beds), a sofa and a chair with ottoman in this space with beautiful hardwood floors. Bunk room guests will love this light and bright bathroom. It’s all brand new with a custom vanity and sinks, commode and stand-up shower. Step out from the living room to enjoy our brand new 15’ x 30’ private pool (one of the largest in Crystal Beach) with a wet deck and spa/hot tub. It’s a gorgeous pool with custom mosaic tile and a large sunning deck all around for you to enjoy the Destin sunshine! The raised spa has a waterfall effect into the pool. Spa/Pool heat is available for an additional fee. Near the pool, there’s a natural gas grill - so no more running out of propane in the middle of grilling your favorite dinner! You’ll also find plenty of seating and a dining table and chairs. There’s also an outdoor shower - perfect for rinsing off after walking back from the beach! You’ll be right across the street from the beach (Scenic 98)! We provide a cart with beach chairs and umbrella, so you can roll your gear to the beach with ease. This home is in the heart of Crystal Beach, a quiet, walkable neighborhood with white picket fences and easy access to shopping, restaurants and activities in Destin. You can bicycle, scooter, Jet ski and go parasailing all within walking distance. The Silver Sands Outlet mall is not far for those who enjoy “retail therapy”! There’s a large parking area in front of the home which accommodates 5-6 cars (depending on size). There is no on-street parking allowed in Destin. We are pet-friendly and welcome your dogs in our home. Pre-approval and a $200 + tax pet fee apply. We know how difficult it is to find a vacation rental to suit your family’s needs, schedules and budget. We’re happy to assist you with the process of finding and booking the right place to stay for your vacation. We don’t leave you hanging—we actually answer our phone and do our best to respond to emails within an hour. We have been in the Vacation Rental 'By Owner' business longer than anyone. Look at our low listing numbers here on VRBO. We own these homes, and are local. We personally ensure our homes are always clean, furnished well, and impeccably maintained. Crystal Beach is location location location. It's quaint and secluded, with cottage-style homes, sidewalks, and white picket fences, and is right on the beach, yet is surrounded by all the best of Destin. Destin Commons is just across the street, and all the other family oriented shopping and entertainment experiences that make Destin a prime vacation destination are all around. Four bedrooms with king beds and huge fifth bedroom that sleeps up to 16 on three real queen beds and two full-over-full bunk beds. Few homes offer so many king bedrooms for adult couples or older kids and still plenty of room for all the younger kids. Also great for large groups of adults such as ladies retreats of golfing trips for guys or gals. 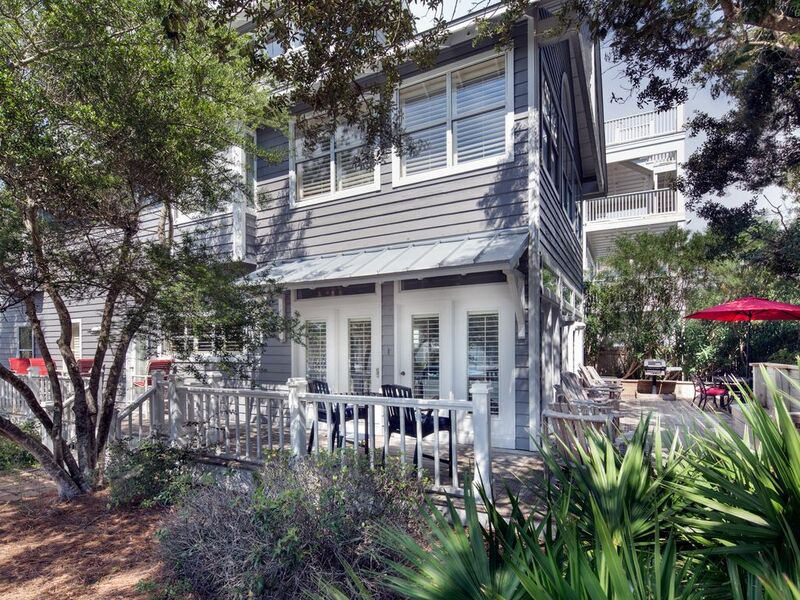 This is one of the nicest and most unique properties in Crystal Beach. It's right on Scenic 98, is large and roomy, and provides the ultimate option for multiple or large families. toilet, shower, Large bath with double vanity, walk-in shower. We provide bath towels. We do not provide beach towels and we ask that you do not use our bath towels for the pool or beach! Thank you! The refrigerator in the kitchen is a full-size, side-by-side and there is another, smaller fridge in the 1st-floor laundry room. Keurig K-Cup and drip types. Screened in pool,. Pool heat is available for an additional fee.